Home Unlabelled Taylor Swift Makes History at 2018 American Music Awards After Teasing the "Next Chapter"
Taylor Swift Makes History at 2018 American Music Awards After Teasing the "Next Chapter"
And just like that, Taylor Swift has reached another career milestone. 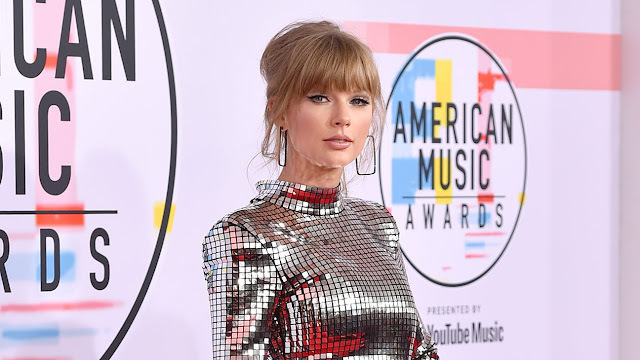 During Tuesday night's 2018 American Music Awards, all eyes were on the "I Did Something Bad" singer from the moment she arrived on the red carpet. Yes, we loved her Balmain dress and boots. And her snake-filled performance was a sweet way to start off the three-hour telecast. But perhaps it was the history-making awards that deserve all the credit when it comes to Taylor's big night. It started when the singer won Tour of the Year. "I want to thank my tour mates, Charli XCXand Camila Cabello…I want to thank my dancers, backup singers, the band," she shared with the crowd. "Most of all, though, to the fans. If you didn't want to hang out with us, we wouldn't have been on an amazingly fun stadium tour. Thank you for everything. I love you guys." The winning streak only continued when she accepted the award for Favorite Pop/Rock Album thanks to reputation. "Guys, I always look at albums as chapters in my life. And I'm so—to the fans, I'm so happy that you like this one. I'm so happy that this means that you like this one. But I have to be really honest with you about something," she teased to the crowd. "I'm even more excited about the next chapter." SAY WHAT?! And if the night couldn't get any better, Lenny Kravitz presented Taylor with the Artist of the Year award towards the end of the evening. "I understand how lucky I am to have anyone that cares about me or my music. Every time that you have made me lucky enough to ever get to stand on a stage and have something really sparkly in my hands and say thank you, every single time this happens, it means something differently to me," Taylor explained. "This time, it represents encouragement and motivation for me to be better, work harder and make you guys proud as much as I possibly can." She concluded, " I wanted to make a mention of the fact that this award and every single award given out tonight were voted on by the people and you know what else is voted on by the people? The midterm elections on November 6th. Get out and vote. I love you guys." Whitney Houston previously held the record for most AMAs won by a female artist. The next step will be to overtake Michael Jackson who earned 24 AMAs during his lifetime—making him the most-awarded winner. What will happen one year from now? We may see something "Gorgeous" in the future.